This is the 9th ODE (Open Dynamics Engine) tutorial. This time, firstly, I explain a unit system and a coordinate of ODE. Secondly, I explain how to set and get a position and a rotation of a body. ODE does not mind any unit system. An angle, however, is radian. In this tutorial, the SI unit system is used. This is very familiar to us (not U.S.A). Length is [m], weight is [kg] and time is [s]. The coordinate system of ODE as shown in the above figure, is the Cartesian coordinate system and right-handed. It is widely used in physics and mathematics. There are nine small pyramids as shown in the above figure. The origin of the coordinate system is the center of pyramids, the x-axis is the direction from the center to the red pyramid. The y-axis is the direction from the center to the blue pyramid. 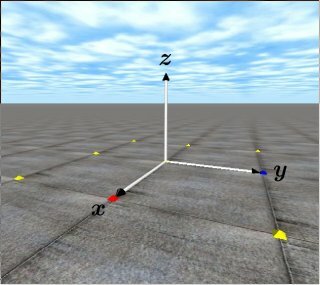 The z-axis is the direction from the center to the sky. These tutorials adopt the SI unit system, so the distance between pyramids is 1[m]. A position and an orientation of a body must be set. The following APIs are used for the purpose. Set a position (x, y, z) in the absolute coordinate system. Calculate a rotation matrix from a rotation axis vector (ax, ay, az) and rotational angle [rad] which rotates counterclockwisely. Set an orientation of the body with the rotation matrix R.
In addition, Quaternion can be used in ODE. The API is dBodySetQuaternion (dBodyID, const dQuaternion q). Get a positon of the body. The return value is a pointer to an array. Get a ratation matrix of the body. The return value is a pointer to an array. In the following sample code, a cylinder is located at (0.0, 0.0, 1.0), and the orientation is set that the cylinder is rotated 45 degrees (M_PI/4.0) along the x-axis. In addition, the center of gravity position of a body is displayed by printPos(). The sample program, sample9-110105.zip (2011-01-05) can be downloaded from here.